My fixation with watches is, along with another for shoes and the finer things in life, one of the mian things I seem to have inherited from my dear father. I used to steal his watches all the time when I was younger but for some years now I have wanted to start a collection of my own. I probably stared at the pictures above for a good 10 minutes after opening an email from Montblanc, who showed their new watch collection at the Salon International de la Haute Horlogerie (SIHH) in Geneva for the first time. You are looking at two of the new members of the Collection Villeret 1858, specifically at the ExoTourbillon Chronographe. It features a large minute-hand and elapsed-seconds hand at the centre of the dial, a small off-centre circle for the hours, a second time zone with day/night indication, a small hand for the continually running seconds and a chronograph with a counter for 30 elapsed minutes. My favourite without a doubt is the model in white gold (left), which together with the model in red gold have been produced in a limited edition of eight timepieces of 18 karats each. I have a tendency for always choosing the finest, most expensive pieces without even knowing it. There is something so mesmerising and somehow mysterious about the way a watch works and this one is extremely beautiful too. 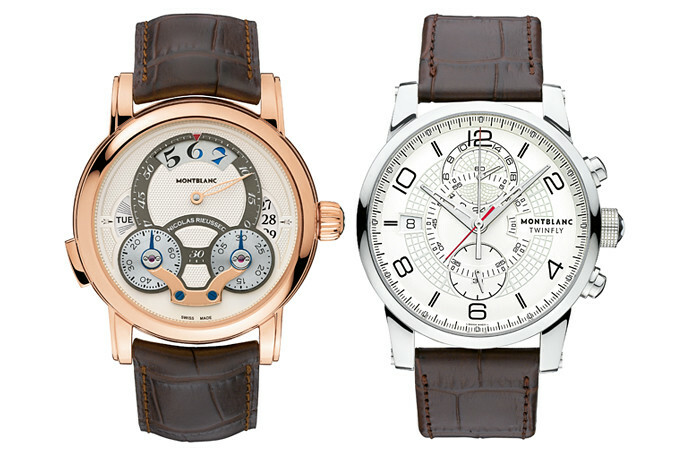 Also at the SIHH, Montblanc presented some of their other lines. Runner up after the ExoTourbillon is the Nicolas Rieussec Rising Hours, which I love in red gold. Not only it's seigniorial and elegant but it features a revolutionary new technology whereby the hour numerals change colour – pale blue during the night and black during the day. – The perfect present for my 25th Birthday in March, I might add. The TimeWalker Watches for Globetrotters collection was also presented at the SIHH. My favourite of the models is the TwinFly Chronograph, which allows its wearer to check the time on two different time zones and is also a 24 hour watch, so you know whether it's night or day. 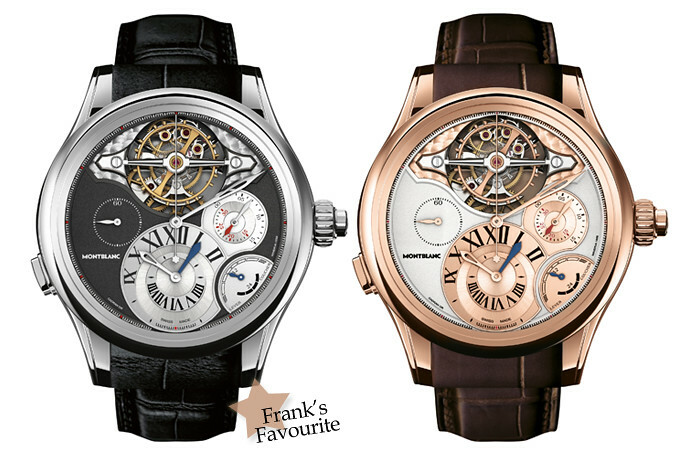 The Villeret 1858 ExoTourbillon collection is available from this month. For the Nicolas Rieussec Rissing Hours and the TimeWalker we will have to wait until October and September 2013 respectively. Check more from Montblanc at the SIHH on their Youtube channel here.